From your CSM you already know about the values, principles and practices of Scrum. Now it is time to extend your capability to overcome the challenges that you have been facing in implementing it at work. Having practised Scrum or a Scrum-like Agile approach for 12 months or more, you know that the ScrumMaster role is a very challenging role to perform in an impactful way. It involves much more than being just a “team facilitator”. It requires development of a variety of skills from professional coaching to systems thinking to change and growth leadership whilst serving the Product Owner and broader organisation in addition to one or more development teams. It requires deep understanding of Scrum, Agile and Lean principles as well as the confidence to challenge both yourself and your colleagues to change their thinking and unwind their ingrained habits. Personal Development – identify your drivers, strengths and weaknesses as a ScrumMaster. Teaching Stakeholders – practice explaining Scrum to stakeholders who don’t share your frame of reference… including executives. Violations of Agile principles – better recognise when people are ignoring Agile principles, when Scrum’s self-adjusting empirical control is compromised and what to do about it. Team Dynamics – understand the attributes of effective teams, a rich team development model, be equipped with techniques for improving team performance and team development pitfalls to avoid. Conflict Navigation – recognise different types of conflict and ways to respond to it effectively. Facilitation – practice techniques for energising regular Scrum events and other meetings, getting past clashes of perspective to get the most out of groups and arrive at decisions that the group is committed to. Coaching – understand how professional coaching differs from advising and practice coaching techniques that you can use every day. Servant Leadership – learn about specific characteristics of a Servant-Leader and how to lead capability building from the stance of Servant-Leader. Serving the Product Owner – practice techniques for moving from vision to product backlog and through to refined backlog with shared understanding. Resolving Impediments – practice systems thinking techniques for revealing the dynamics causing impediments and where to best intervene to truly eliminate them. Definition of Done – practice surfacing what is required to deepen your Definition of Done to Potentially Releasable every Sprint. Complimentary frameworks – know when to leverage XP, Kanban and Lean Startup techniques in ways that compliment Scrum. Engineering Practices – understand the various technical practices and how they improve the team’s ability to sustainably deliver potentially releasable increments and enable scaling. Scaling Scrum – understand key differences between scaling frameworks, gain techniques for visualising, reducing and eliminating dependencies and well as for facilitating large-scale meetings. Certification as an Advanced Certified ScrumMaster (A-CSM) for participants who satisfy all coursework requirements to the satisfaction of the trainer. Support to have your post-course questions answered via the Scrum WithStyle Alumni network. Guidance on continuing your professional development along the Path to CSP. To achieve the certification, you must meet the prerequisites (as stated below), you must attend the full two day course, and complete all coursework, including all in class coursework and any pre, during and post training event coursework that we provide as part of the course. You will then be eligible to receive your certification. There is no test or exam component as part of this certification. 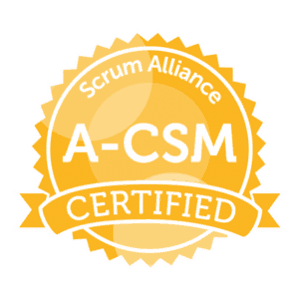 Attaining your A-CSM is the second of three substantial accreditation steps toward becoming a Certified Scrum Professional in the ScrumMaster track (CSP-SM). Actively participate in the full two-day course and complete all coursework to the satisfaction of the trainer.